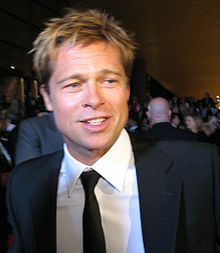 Ta William Bradley "Brad" Pitt ny Brad Pitt ny chloieder as ghienteyder fillym as ny ghasteydeyr sheshoil Americaanagh. Rug eh ayns Shawnee Oklahoma er 18 Mee ny Nollick 1963. Ta enney share er er son e paartyn ayns ny scannaneyn Twelve Monkeys, Legends of the Fall as Troy. V'eh poost rish Jennifer Aniston veih'n vlein 2000 derrey 2005, as nish she Angelina Jolie eh pharteeas.